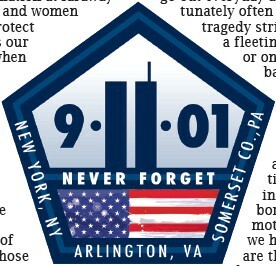 As another September 11th comes and goes many of us think back to where we were on that horrible morning. With good reason, many of us pay our respects to the military service members, who still put themselves in harm’s way to protect our nation at faraway locales. We salute the men and women in law enforcement who protect us here at home, as well as our firefighters, who rush in when catastrophe strikes. These callings are honorable ones, and the individuals who answer these callings deserve our thanks. But, as we commemorate the 11th anniversary of one of the most fateful days in American history, I would like to take a moment to recognize an often overlooked segment of those here in our nation, those who face a daily stress that many of us do not have to deal with. The families of our servicemen, police officers and firefighters. The spouses and children, who on a daily basis kiss their fathers, their husbands, their daughters and their wives goodbye, as they send them into the gauntlet so that we can live a peaceful existence. Since September 11th, 2001 thousands of wives have received the tragic news that their serviceman would not be returning home. Thousands of children have had their hearts broken because their mother or father, who donned a badge and gun to “protect and serve” was killed in the line of duty. And yet another fraternity of families belongs to that of firemen who would not be coming home from their shift because they risked their own lives to save those of complete strangers. These men and women… this support system, that allows our first responders to go out everyday and do their jobs, unfortunately often go unrecognized. When tragedy strikes, we see their faces for a fleeting moment in a newspaper or on TV and then they fade back in to oblivion. New York City. Our cities and towns enjoy relatively peaceful existences in comparison to those of bordering nations, and when mother nature wreaks havoc, we have men and women who are there in minutes to save lives and put the pieces back together. And none of this would be possible without those who support our protectors, our defenders and our rescuers at home. If you have a husband, wife, parent or child who puts themselves at risk to protect our society, thank you for what you do behind the scenes. Thank you for being a voice of encouragement, a shoulder to cry on, and a foundation for your family to rely on when the stresses of the job hit home. Thank you for doing what you do, because if you didn’t…we couldn’t do what we do.